Evergreen Pet Cremation - Pet Cremation Services for Oak Harbor, Island County, San Juan, Skagit and Whatcom. We have professional, welcoming facilities for you and your pet. Interested? Speak with one of our staff today to learn more. Friendly Pet Cremation Services for Oak Harbor, Island County, San Juan, Skagit and Whatcom. Saying your last farewell to a beloved pet is one of the most difficult experiences in life. They fill our lives with joy and laughter and ask little in return. That’s why the thought of leaving a pet behind at a veterinary clinic for disposal by the city is too emotionally difficult for most people to handle. However, there is an alternative that lets you preserve your old friends memory in the respectful, humane manner they deserve. 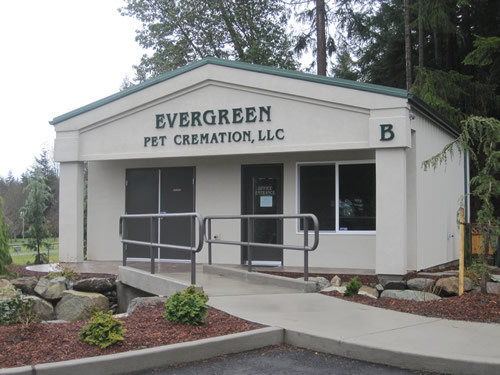 Located on the grounds of Wallin Funeral Home & Cremation in Oak Harbor, WA, Evergreen Pet Cremation is a full service cremation center for pets, dedicated to honoring the life and memory of your deceased pet.